MakerBot, one of the pioneers in bringing low-cost, more accessible 3D printing to the masses, just launched its next-generation 3D printer platform, complete with a range of capabilities that make it even more interesting to professional engineers. 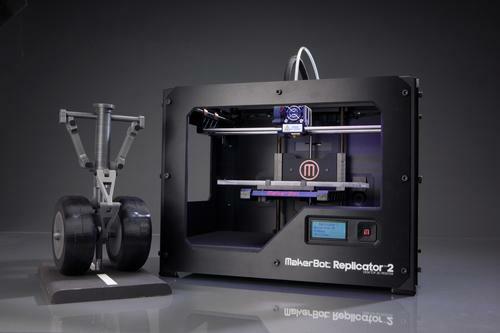 The MakerBot Replicator 2, and its turbocharged counterpart, The Replicator 2X, feature 100-micron layer resolution (0.10mm) and a bigger build volume of 410 cubic inches (11.2-inches-long x 6-inches-wide x 6.1-inches-high), extending the size and complexity of models that can be produced by the printers. The new 3D printer models aren’t targeting the home enthusiast specifically, but rather are being aimed at engineers, researchers, creative professionals, or anyone else who loves to make things, according to company officials. With its 100-micro layer resolution, the MakerBot Replicator 2 aims to set a new standard in professional-looking models and true-to-life replicas. The larger build platform and the printers’ high-resolution capabilities up the ante in terms of allowing users to output more polished and finished-looking models at a price point significantly less than other higher-end professional 3D printers. The Replicator 2 outputs 3D designs using the renewable bioplastic material PLA, not the more popular ABS material. Officials said PLA was chosen because of its strength and ability to make very large prints without cracking or warping. The Replicator 2 printer, available now, costs $2,199, a price point that is far more attractive to small and midsized engineering shops and departments while still putting it somewhat out of reach for mainstream consumers. The original Replicator, announced earlier this year, was priced a couple of hundred dollars less and was limited to a 0.2mm to 0.3mm print resolution. The new version is also more professional looking — it’s encased in a black steel enclosure as opposed to original versions that were built of wood and looked more like a hobbyist kit or toy. For professionals looking for even more robust capabilities, MakerBot released the companion Replicator 2X Experimental model that allows advanced 3D printer experts to work through some of the challenges associated with the use of ABS thermoplastic filament. The printer features experimental dual extrusion capabilities, which “enables the daredevils and trailblazers of 3D printing to explore the frontiers of multiple materials and colors,” said Bre Pettis, MakerBot CEO, in a press release announcing the new products. This model, priced at $2,799 and available in early 2013, comes with an updated dual extruder tool and an updated heated build platform.